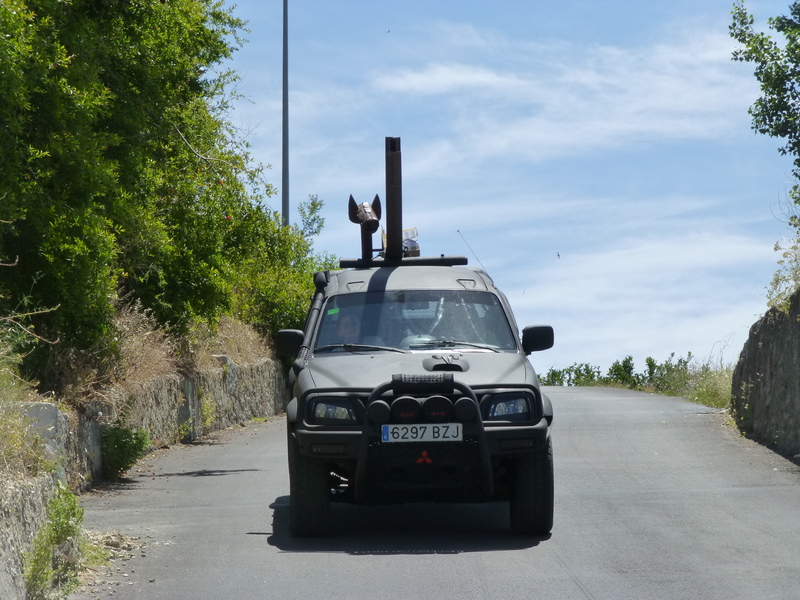 We were robbed by bogus policemen on the outskirts of Madrid a few years ago now and I so wished I’d had my camera with me then. Nowadays I make a point of always having my trusty Panasonic with me and from time to time I’ve been in the right place at the right time to capture a ‘just happened’ happening. It’s also fun to seek out the weird and wonderful too. 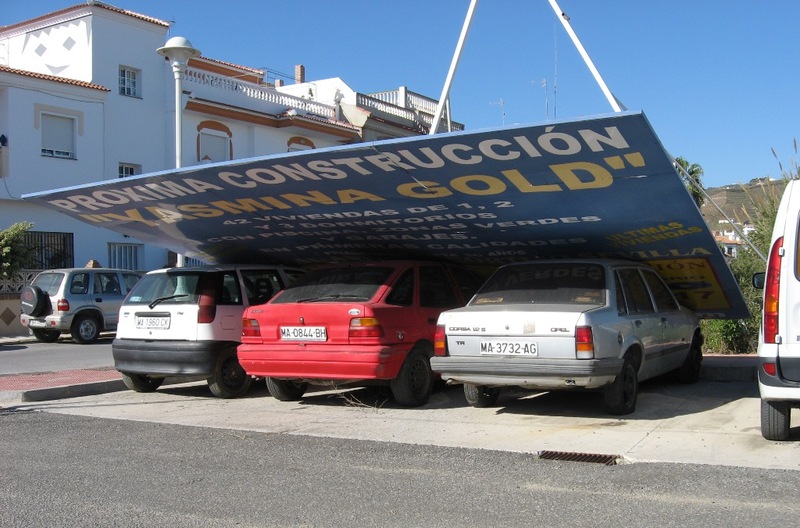 We’d had some very strong winds the night before, but I never thought I would actually see an advertisement hoarding fall on a line of cars! Then in Torre del Mar we saw a car showroom that had a black BMW for sale, emblazoned with the words ‘semi nuevo’ (nearly new). As you can see, it looks far from appealing wearing half a ton of debris from the collapsed ceiling! 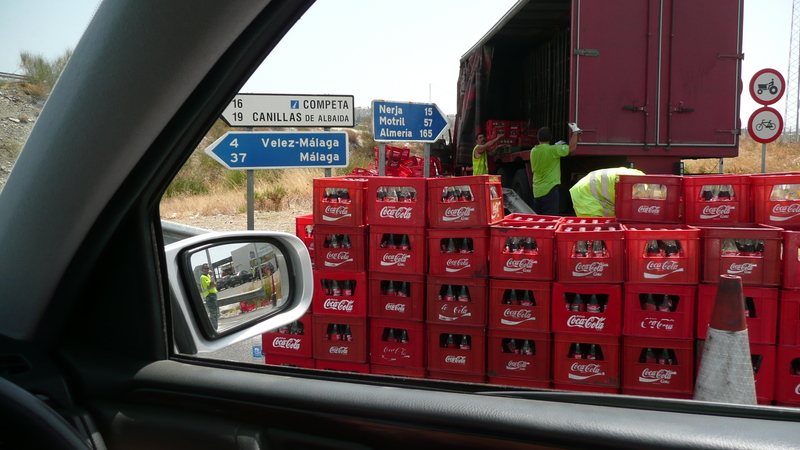 Then there was the Coca-Cola lorry that went far too fast around a roundabout. 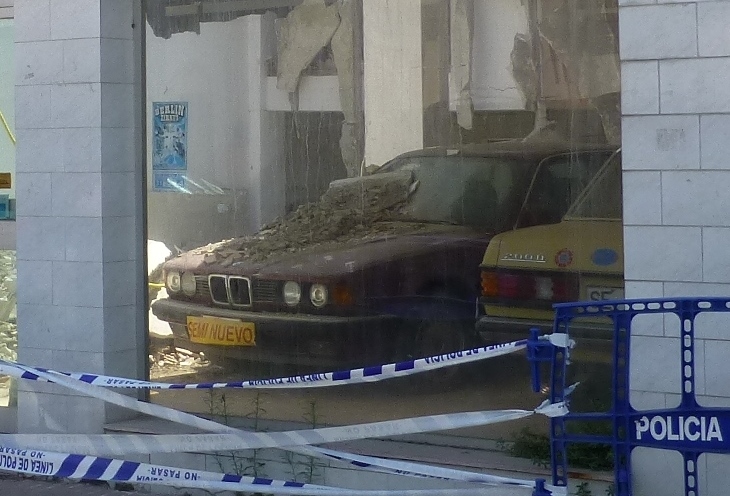 We got to the scene about 10 minutes after the clean-up operation had started. 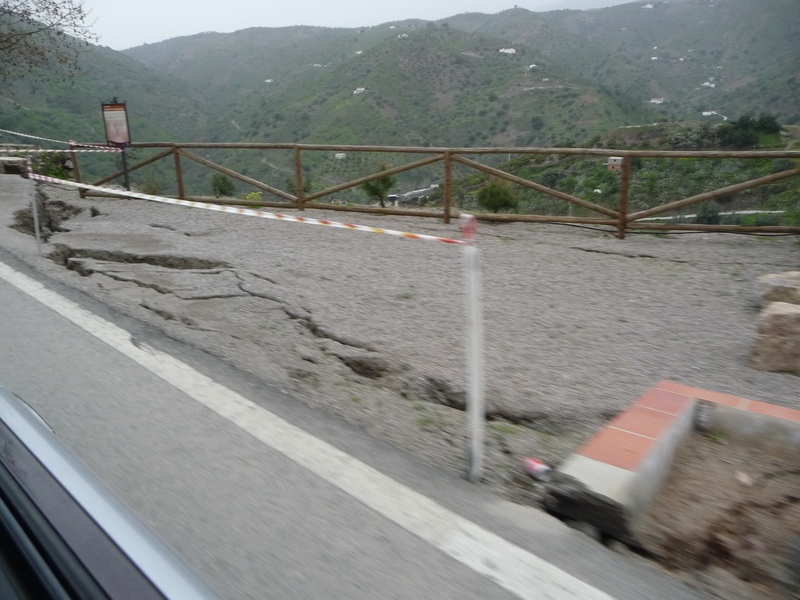 Still on a motoring theme, the always-unexpected rainy season brings with it more damage to certain roads, already marked by signs saying ‘firme en mal estado‘ (road surface in poor condition). 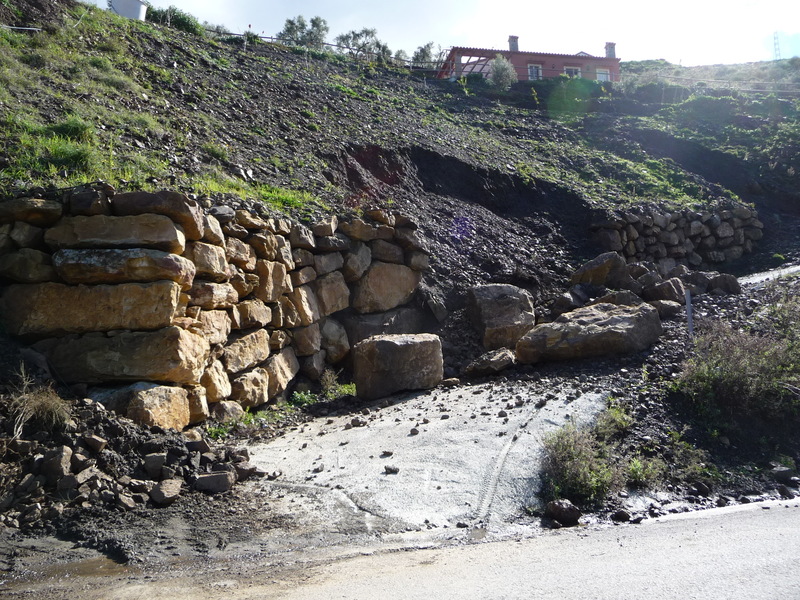 Landslips cause lots of damage and can cause huge retaining boulders to tumble onto drives; but nothing that can’t be put right by a digger when it’s dry again. Then there was a broken water pipe which, for many hours, was flailing around spraying tons of water over loose soil which then made the rather flimsy track above it quite unsafe. 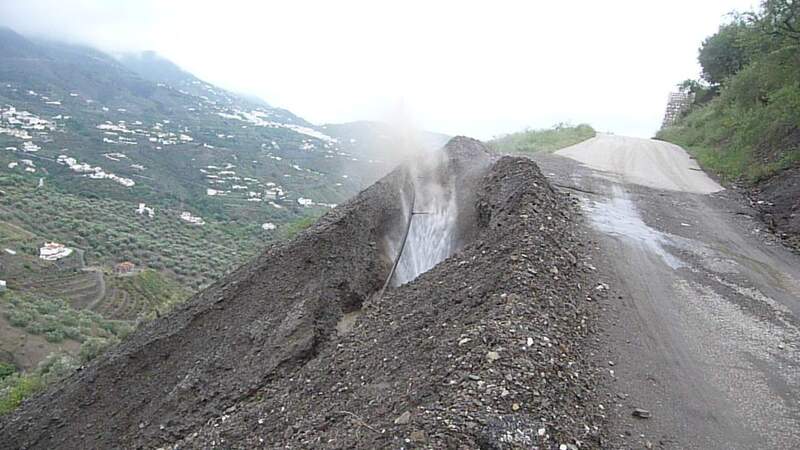 I did worry that if it continued unabated into the night, then some poor person driving along there might become a casualty if the track finally gave way. What did I do? Usual stuff, nothing – didn’t know who to contact, or what to say. 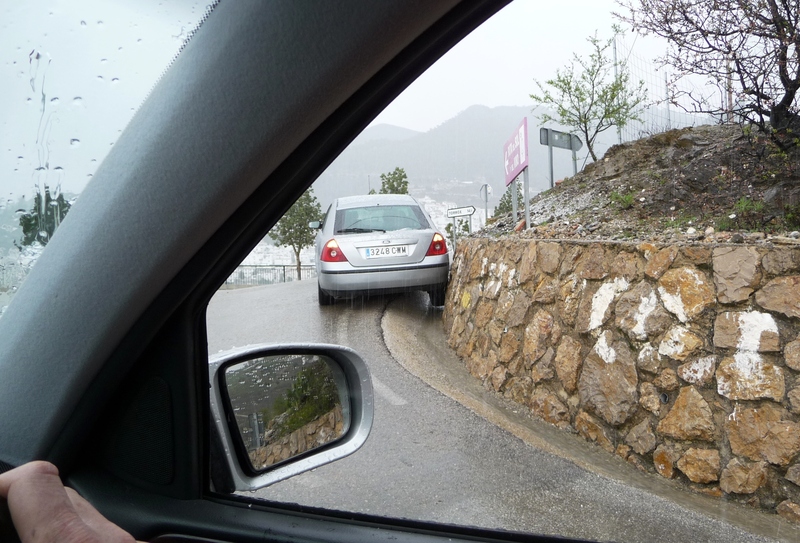 After a sudden hailstorm we came across this abandoned car stuck firmly on a wall on a very nasty, busy bend. Not quite sure how it got itself there. Local people always seem unprepared for wet weather..
Or how about this picture of the local police car? 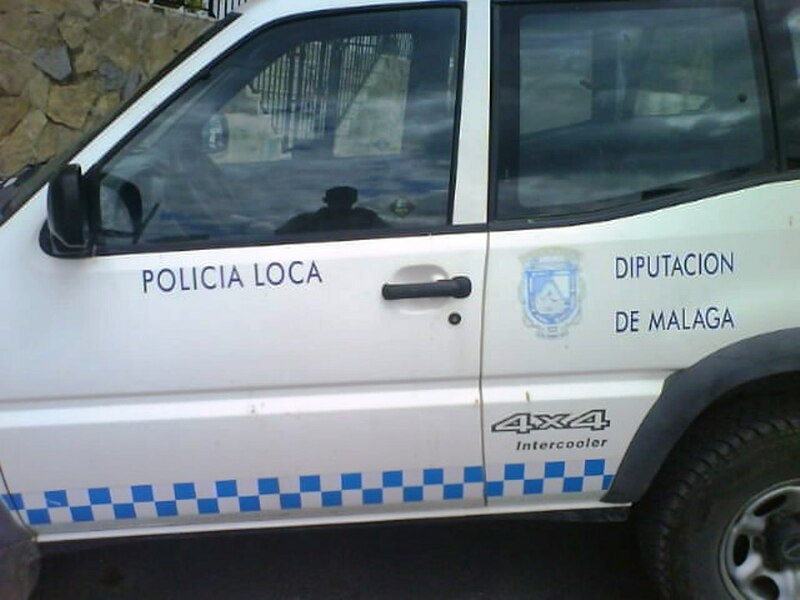 It should say ‘Policia Local‘, ie local police, but someone has scratched off the final ‘l’, so it actually says ‘Policia Loca’ ie mad police! We continued to see this car for a few years but no-one ever put the ‘l’ back! I wrote in an earlier post about Giraldo, one of the two local goat-herders. 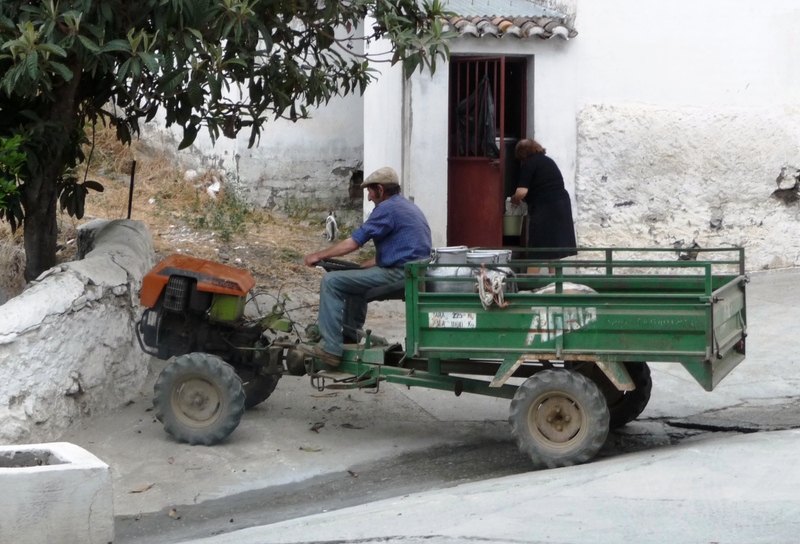 This is a picture of him manoeuvring his vehicle in front of his house with wife in the background – the one who makes the cheese. It’s some sort of hybrid, based perhaps on a dumper truck, and we can hear its invasively loud pop-pop-pop as he makes his weekly trip from his goat house across the valley back home laden with churns of his prized goat milk. And I couldn’t resist taking a photograph of local artist Placi delivering the wooden horse we’d just bought from him. The horse looked as though he was thoroughly enjoying taking in the scenery on the way to his new home! Time for some furry, cute things now. 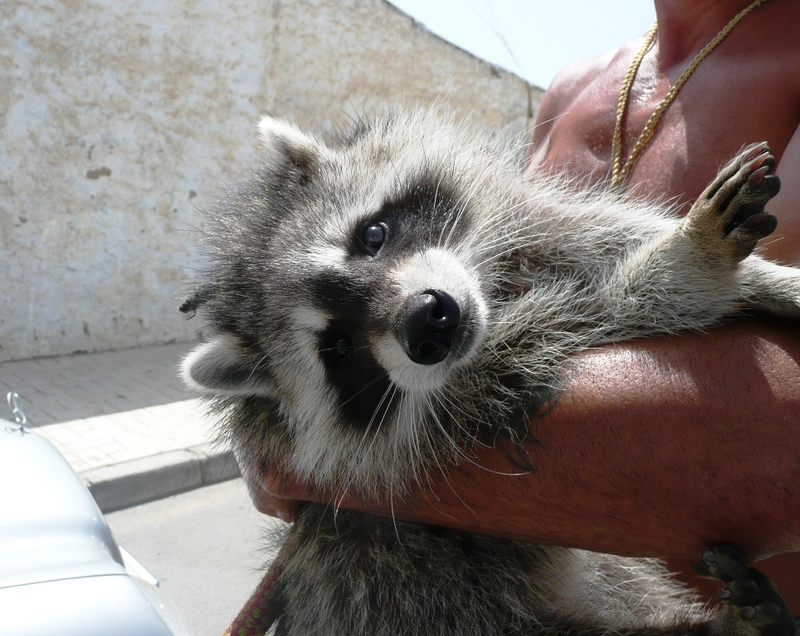 We never expected to come across a raccoon on a lead in Caleta de Velez, a little fishing town on the Costa del Sol. Its two companions made it look as though it was a perfectly natural thing to do, walk one’s raccoon in the hot sun and surprisingly most people that went past didn’t even take a second glance. 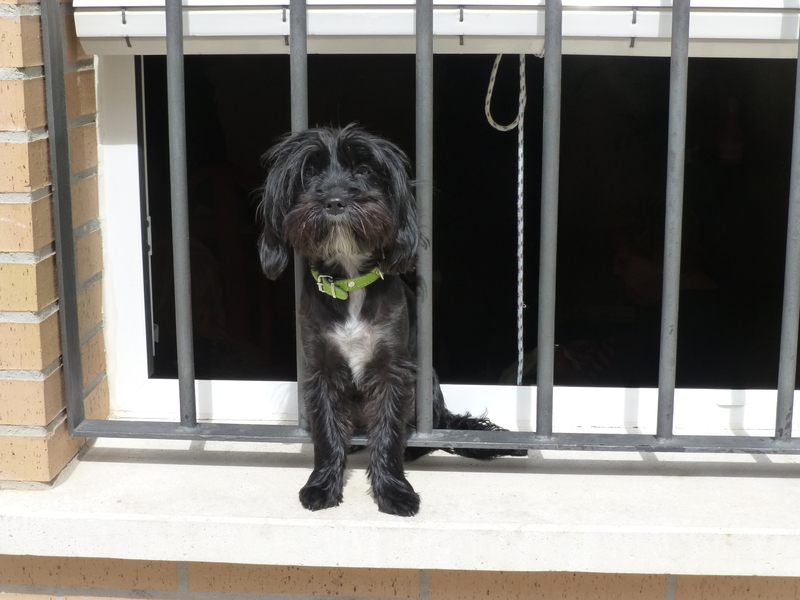 This little black dog we saw in Nerja probably could have squeezed herself through the railings, but seemed content to wag and watch the world go by. Our Ukrainian friend Roman did some work for us around the house and he usually brought two of his five dogs with him. 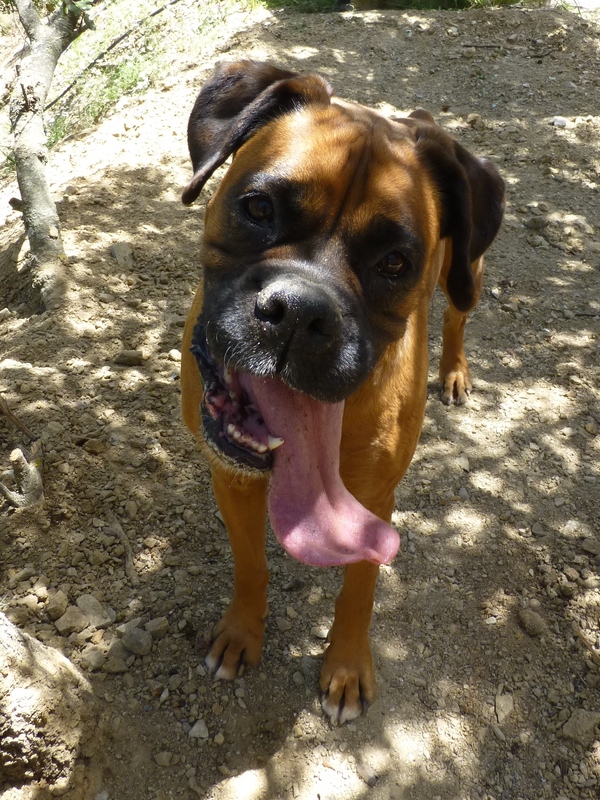 It was a very hot day and his boxer was a damned nuisance and very persistent. Completely unaware of the hot sun blazing down, so fixated was she on driving us mad by nuzzling stones for us to throw, not letting up for a second! By contrast, although his lovely little Jack Russell was always very industrious and felt duty bound to check out even the merest whiff of a rodent, the heat eventually got to her. Luckily she found this rather novel solution. 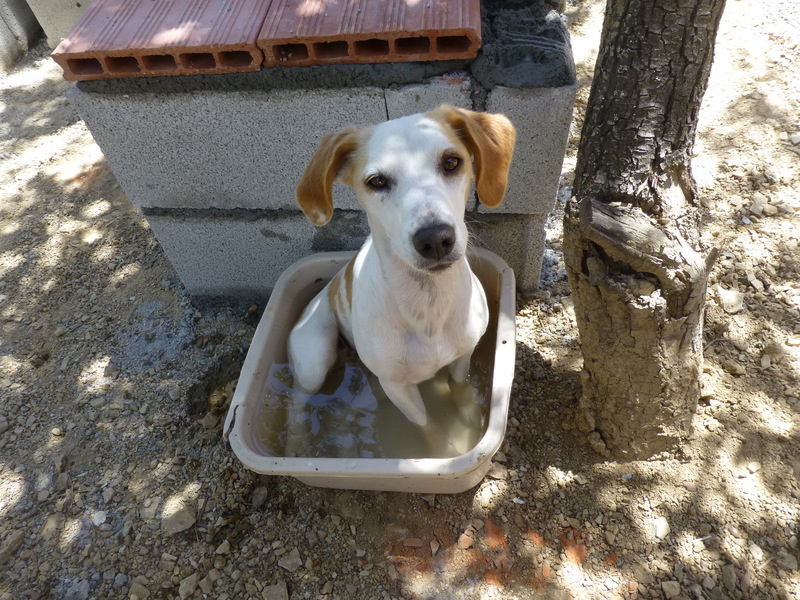 Loved the dog sitting in the washing up bowl.